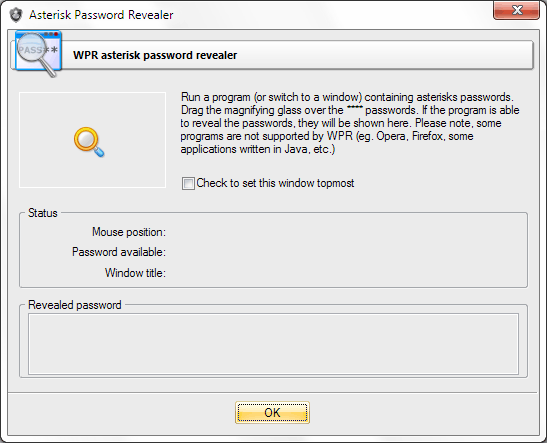 This tool allows viewing passwords hidden behind asterisks. It is often helpful when you need to quickly recall a **** password and don't have the necessary recovery tools handy. In order to get the *** password visible, you should have to drag the magic magnifier from the WPR window to the field with asterisks. In some Windows system dialogs asterisks also hide the * character and not the real password. To ensure the proper operation of this tool, you are to have the administrator privileges.